If you need to make special emphasis on important words or highlight text in PowerPoint then using this technique we will describe below you can create stunning slide designs that help to make focus on the most important concepts while presenting your slides. 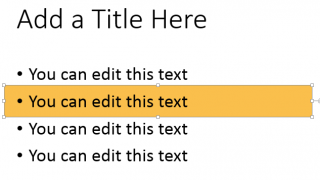 There are several ways to highlight text in PowerPoint 2013, 2010 or 2007, during the slideshow or edit time. 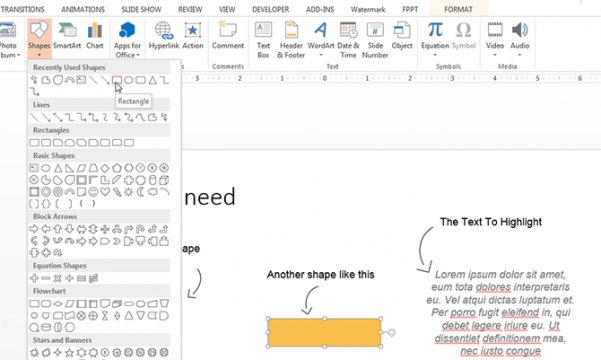 Our approach here is more focused to highlight text during edit time so you can easily export your presentations as PDF or any other format while keeping the highlighted text or annotations. 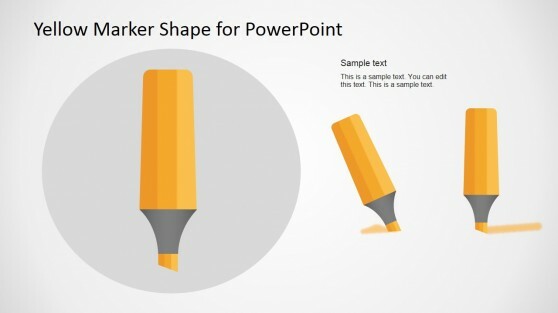 First of all, we’d need to draw a rectangular shape in PowerPoint and change the background color. You can choose a shiny background color like yellow or red. You can also remove the default line border that is added to the shape once inserted. Send the rectangular shape to the background of the slide so the text is in front. Select Format -> Send to Background. Now, move the rectangular shape to the exact position below the text you want to highlight. You can use the mouse to select the shape and then move it to the desired position. Make sure you choose a proper font color that makes the text and background have a good contrast. 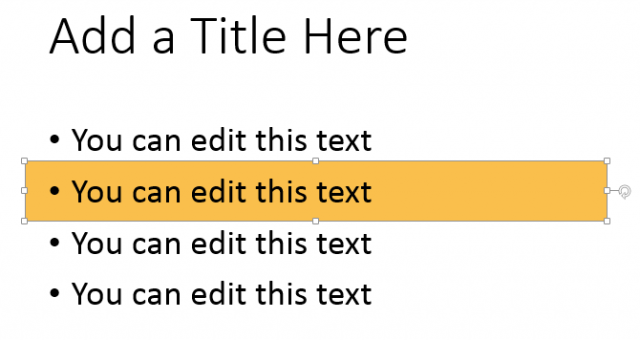 Using this approach you can highlight any kind of content like text descriptions, bullet lists or even other elements or graphics embedded in a PowerPoint slide. Additionally, if you want to give it more emphasis, you can use any of our pre-designed marker shapes, pencil or pen tools. Download any of our shapes from our content catalog and then insert it in a position that makes it look realistic like in the examples below. This way, the slide design will be slightly improved and the audience will be more focused to the text you are highlighting improving the overall presentation. Here you can see some additional samples where we have used this approach to highlight text. The presentation is hosted at SlideShare. * The highlight automatically adjusts when you edit the text. * You can copy the highlighting by using the Format Painter. Thank you for your comment. Very interesting method! Thanks for sharing.